Dates are among the sweetest fruits in the world and fresh ones are a far cry from the sugared, desiccated, chopped ones sold in boxes on the shelves of grocery store baking aisles. Below are some key points about fresh dates below, including, of course, some tasty ideas on how to use them. Dates are the fruit of date palms, which themselves come in many more varieties than anyone only familiar with dried chopped dates might imagine. If you've never had a freshly harvested date, they are worth seeking out for their insanely sweet, caramel-like taste and—this is where they differ most from dried dates—their soft, downright luscious texture. That said, most dates are allowed to hang on the trees to "cure" and dry a bit before being harvested so they will last longer once picked. These are the "fresh dates" available at many specialty grocery stores, and they are also perfectly, utterly delicious. Since palm trees grow best in the desert, the U.S. crop of dates is grown in the deserts of California and Arizona. The U.S. harvest then takes place between September and March. Farmers markets in Southern California and Arizona may have fresh dates in season; they are also available mail order from some growers and may be found at specialty stores and, often, Middle Eastern markets, since dates play a significant role in the cuisine of many Middle Eastern countries. Fresh dates can be wrinkled, but they shouldn't feel hard. Look for fresh dates that are plump looking and have a slightly glossy look to their skin. Avoid dates that have crystallized sugar on their skins (a little whiteness is okay, but not actual crystals), since that means they are not quite as fresh as you might like. There are endless varieties of dates grown in the Middle East. 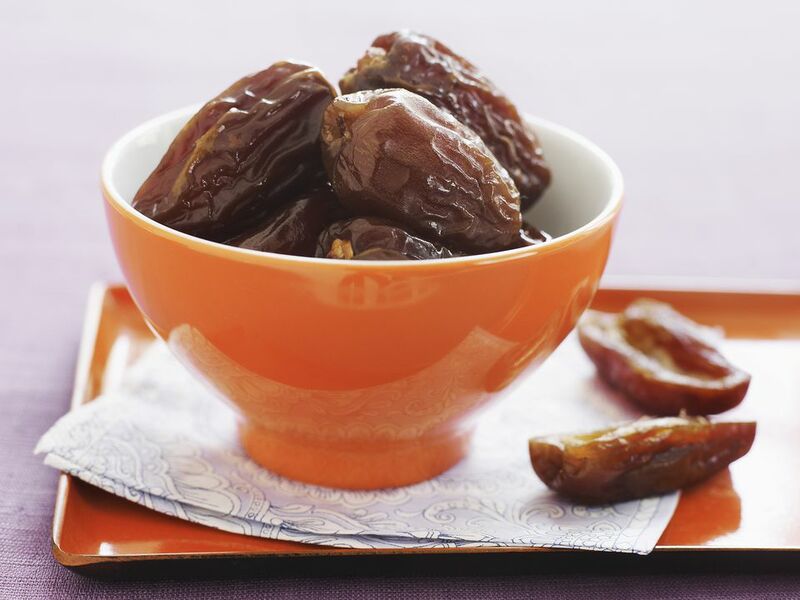 In the U.S. the most commonly available dates are Deglet Noor dates, which are semi-soft, slender, and a bit chewy, and Medjool dates, which are plump and tender. Other varieties may be available at your farmers market if you're lucky enough to have date growers selling there. Dates are also classified by when they're harvested since that determines how soft or dry they are. Freshly harvested dates are very soft; as mentioned above, most "fresh dates" for sale in the U.S. have been left on the tree to dry a bit for awhile after they are ripe (and thus last longer after harvest) and these will still be quite soft, but have a bit more of a toothsome quality to them. Fresh dates that have been "cured" are partially dried and will last awhile. Store them in a sealable container at room temperature for up to two months. They will continue to dry out, and their sugars will slowly but surely come to the surface, creating white spots that are sugar, not mold. Fresh dates are, to my mind, best eaten just as they are, with a cup of coffee or mug of tea alongside to cut the sweetness. That said, there are many ways to enjoy them. Add them to salads or to sweeten roast chicken or pork. They are delicious in rich stew-like tagines. Serve them, pitted and stuffed with Parmesan or blue cheese, as simple appetizers. Or, of course, use them in baked goods. Or, get very Southern California, and make a date shake by whirling 1/2 cup fresh pitted dates with 1/2 cup milk and 1 cup of vanilla ice cream until smooth and shake-like. That's enough for one modest serving—feel free to double the recipe. If you want to add a shot of brandy, you wouldn't be alone. How Well Do You Know Avocados?